We got home from Paris last night and had about 12 hours sleep. It’s morning and it feels like morning, yay! 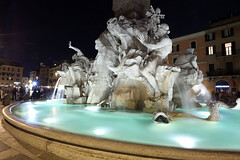 Here’s a photo from Piazza Navona in Rome. This entry was posted on Wednesday, 23 May, 2012 at 09:53	and is filed under Photography, Travel. You can follow any responses to this entry through the RSS 2.0 feed. You can skip to the end and leave a response. Pinging is currently not allowed.